On the Edge has some nice pictures on her blog from her recent trip to Yefren (a town in the Nafusa Mountains). Among the pictures are some of the old synagogue. I just thought I'd mention it because I often get requests from Libyan Jews to show what I can of the old Jewish sites. It's nice to see that it's still pretty well preserved. Have you got anything for pain? My husband's cousin recently had a kidney transplant. He'd gone in the past to China hoping to find a donor (after refusing his sister's offer of hers) but he didn't find one so he came back. At first he thought he'd just give up and live his life as best as he could, but in the end, he decided to take up his sister's offer of her kidney. The surgery was performed here in Tripoli. I went to visit on the day the sister came home from the hospital. She had been released after about 4 days and was in quite a lot of pain. I asked her what pain medicine she was taking and she said they only gave her pain meds on the day of the surgery and she was told she didn't need them after that because they 'weren't good for her'. Her brother was still in the hospital, being the receiver of the kidney, it was going to take longer for him to recover. The woman was in a small room off a large reception hall on the ground floor of their house. She was laying on a twin-sized bed in the corner covered in blankets. The women visiting (there were about 40 of them when I got there) were all in the large reception hall drinking glass after glass of tea while small children ran in and out and babies wailed relentlessly. Every time a new visitor arrived she shook everyone's hand and kissed everyone and then was led into the small room to shake the poor woman's hand and kiss her too. My husband had been warned (by me) when he dropped me off to make it a quick visit. He was elsewhere sitting with the men. After making the rounds and shaking hands I sat down to listen to the latest gossip and drink tea. It was the usual talk of marriages, engagements, pregnancies and illness. I just let their chatter float over me while I watched the toddlers running around. The auntie mentioned that right before I arrived one of the kids had run smack into a pillar in the centre of the room and cut his head open. One of the men had taken him to the emergency room to get stitches. From my personal experience it was a normal Libyan get together! At least one kid gets stitches at every event and another will break a bone. One little girl, who looked to be about three years old, ran over to our group to touch base with her mother. She had her heavily greased hair in about 30 tiny ponytails. The discussion turned to what to do to make hair soft and straight, and the girls mother was proudly telling everyone that the secret was coating the hair daily in Ibuprofen oil. Many of them admitted that they were doing this too. The most common side effects from ibuprofen are rash, ringing in the ears, headaches, dizziness, drowsiness, abdominal pain, nausea, diarrhea, constipation and heartburn. NSAIDs reduce the ability of blood to clot and therefore increase bleeding after an injury. Ibuprofen may cause ulceration of the stomach or intestine, and the ulcers may bleed. Sometimes, ulceration can occur without abdominal pain, and black, tarry stools, weakness, and dizziness upon standing (orthostatic hypotension) due to bleeding may be the only signs of an ulcer. NSAIDs reduce the flow of blood to the kidneys and impair function of the kidneys. The impairment is most likely to occur in patients who already have impaired function of the kidney or congestive heart failure, and use of NSAIDs in these patients should be cautious. People who are allergic to other NSAIDs, including aspirin, should not use ibuprofen. Individuals with asthma are more likely to experience allergic reactions to ibuprofen and other NSAIDs. Fluid retention (edema), blood clots, heart attacks, hypertension and heart failure have also been associated with the use of NSAIDs. In the past I would have had to put my two cents in during their conversations but I have given up. They never listen to me anyway - I'm just the 'ajnabiah'. 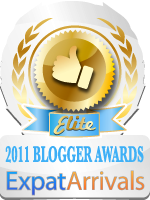 So I just sat and listened and kept my opinions to myself (I can vent my gripes here on my blog ... hehe). The thing that I found so ridiculous was that the woman talking had a university degree. She also had a computer and she had access to the Internet. It had taken me all of three seconds to look up the side effects of Ibuprofen! I used to feel sorry for these women because when I came here 20 years ago you didn't find many that had much education. But now things are different. Women here have access to knowledge, they have Internet and they can watch all kinds of informative programmes on hundreds of TV channels. I don't feel sorry for them anymore. I feel disgusted. The saddest thing was the poor woman suffering with pain because taking pain medicine after having major abdominal surgery 'wasn't good for her'. Meanwhile they are pouring pain medication on their heads! OK... I've gotten that off my chest... I feel better now! I went to the supermarket and stopped in the section that sells housewares to pick up some clothespins. Six packs of them. He insisted that they were of the finest quality wood. I just looked at him and said 'Well since they are so wonderful you can keep them all for yourself because I'm no fool.' and off I went leaving him with his clothespins. I drove down the road to another shop and got clothespins for the regular price of 75 dirham for each pack. Now the clothes are flapping in the wind on the clothesline. 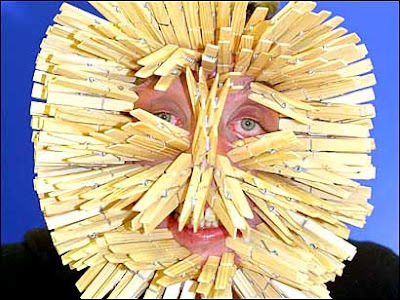 Maybe I should threaten to do this to Ibrahim if I catch him messing with my clothespins again! 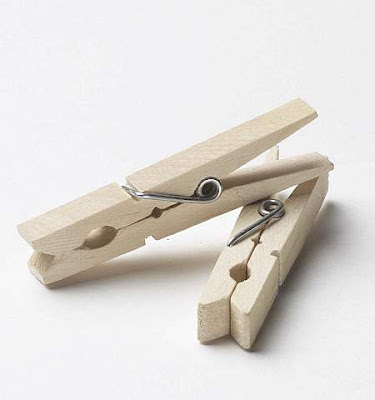 I am sick and tired of buying clothespins! Ibrahim has been obsessed with throwing clothespins off the balcony for years now. He tosses them across the wall and into the neighbour's garden and aims them at the stray cats. I probably buy at least 200 clothespins a month - usually more. No amount of reasoning with that boy works.. and believe me I think I've tried everything! I've got to go out once again and buy MORE clothespins today. It's windy and we've got lots of laundry... sigh... It would be nice if I could get a clothes dryer but unfortunately my building was built years ago before such things existed or were thought of and the electrical wiring in our flat isn't able to handle the load. As it is, we have to do the 'electricity swap' every time we want to use something that would require a large amount of electricity - this means if we want to use an electric space heater in the boy's room we have to turn off the water heater in their bathroom. Typically a Libyan house has very few electrical outlets too - so we have extensive use of extension cords running throughout the place. I like to keep up with events around town and often check the Libyan Investments website. But when I try to look there nowadays my antivirus goes completely berserk, shouting out Trojan warnings left and right. .... sigh .... what a headache. We had a peaceful day yesterday. After lunch we took a drive in the country and visited with friends. Just what we all needed. It's been an extremely dry winter this year. The field in the picture below is normally full of wildflowers at this time of year, but it was dry. You can see the mountains of Gharian in the background through the haze. I think it's time to start praying for rain... or do a rain dance or something. This winter has been so mild. We've only used the heat in the house a few times and I think I wore a sweater only twice. I always look forward to winter because I enjoy the rain - but this year there's hardly been any. And spring is just around the corner. The almond trees are already in bloom. It was a nice, quiet Friday. Today I'm going to be busy running errands and doing housework. Tomorrow the kids go back to school - their mid-term holiday is over. Back to routine again. Jenna is insisting on a new school uniform for the next half of the school year. Her legs have gotten longer or her pants have gotten shorter! We'll have to see what we can find. This week seems to be dragging on and on. I think it's partly because of the lingering remnants of the flu that I'm still recovering from. There's also the fact that the kids are on school holidays and are bored to death. They moan and complain that they've got nothing to do. While I was watching the film the kids were busy watching our cat, Layla, giving birth to kittens. Jenna came in to tell me every time a new one emerged. She had three, all of them healthy and cute.